If you’ve been wondering how to seamlessly integrate an experiential event with Facebook, a summer event at Coca-Cola Village Amusement Park in Israel showed us all how to do it, in real time! 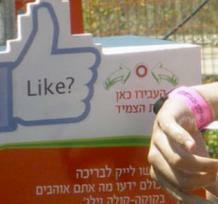 For the teenagers attending the Coca-Cola Village Amusement Park in Israel, the event was probably just a bit of fun. But in the world of social networking and online marketing, the world’s first real-life RFID event tied to Facebook was an event of greater significance. Every year, in July-August, thousands of kids in their summer break attend ‘The Village’, a 5-day camp, organized by Coca-Cola Israel, with fun activities, pool, social games and Coca Cola drinks of course. This year they decided to run the event through Facebook with teenagers needing to collect 10 Coca Cola caps each, gather eight friends who did the same and then register online through Facebook to gain exclusive entry. The way it worked, according to Adland, is that visitors to the amusement park wore RFID bracelets. When they got to the Coca Cola Village, they were asked to setup a special wrist band that would securely hold their Facebook login and password to swipe when starting each activity. This allowed people to log into their Facebook accounts and then ‘like’ various attractions such as the water slides and video games. Teenagers love photos so there was a photographer present; if you wanted to tag yourself in any given image all you had to do was wave your ID bracelet to the photographer. Integrating the three-day event with Facebook via RFID was the brainchild of advertising agency Publicis E-dologic and it was wildly successful. According to the video embedded above, the teenagers used the Facebook functionality non stop. With only 650 teens a day, they generated 35,000+ posts every day for the three days totaling over 100,000 posts for the event! Could the 'real world Like' become the new 'Check In'?